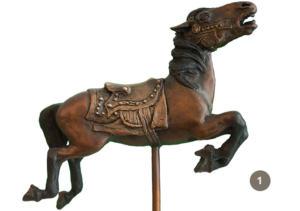 A Limited Edition of six bronze carousel horses to support The Carousel of Smiles. 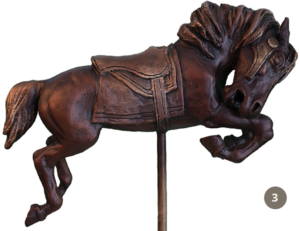 Bronze castings by The Kalispell Art Casting Foundry. To purchase individual horses or the full set, please contact us. 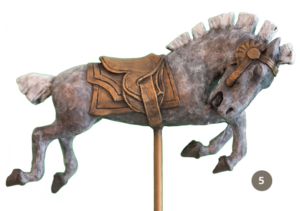 Note: All monies raised through the sale of this artwork will go to support the ongoing carousel restoration. 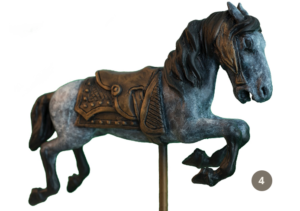 For over thirty years, Gabe Gabel’s international reputation has solidified as a quality sculptor and painter. 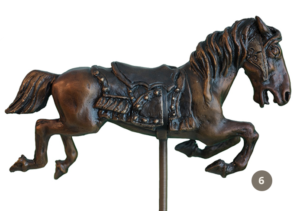 Horsemen of all schools have marveled at her ability to recreate the power and movements of different breeds with all their individual characteristics. Her name has become synonymous, not only for anatomical and historical accuracy, but for the incredible feeling of life portrayed in her work. Gabe seeks inspiration from her lifetime of experiences and interests; she can handle the rather gritty reality of life at a fur-trade era rendezvous, living in a tipi for weeks at a time, and is comfortable in buckskins to ball gowns! 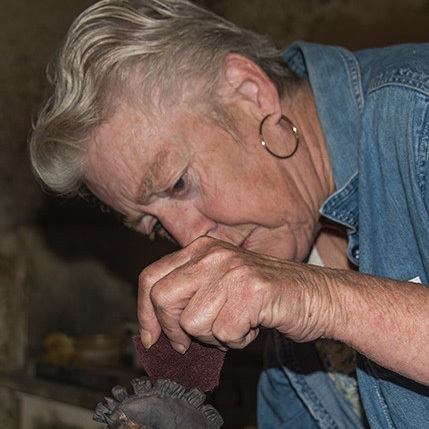 Gabe participates in art shows and gallery appearances all over the Western states, from Alaska to Texas, and has won numerous prestigious awards. 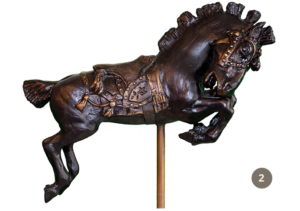 Her work is highly collectable, and when you add a Gabe Gabel sculpture to your art collection you will find, as so many collectors have, a special treasure that will be a source of pride and delight for all the years to come.